I bless the rains down in Africa - adjacent to Prowler. 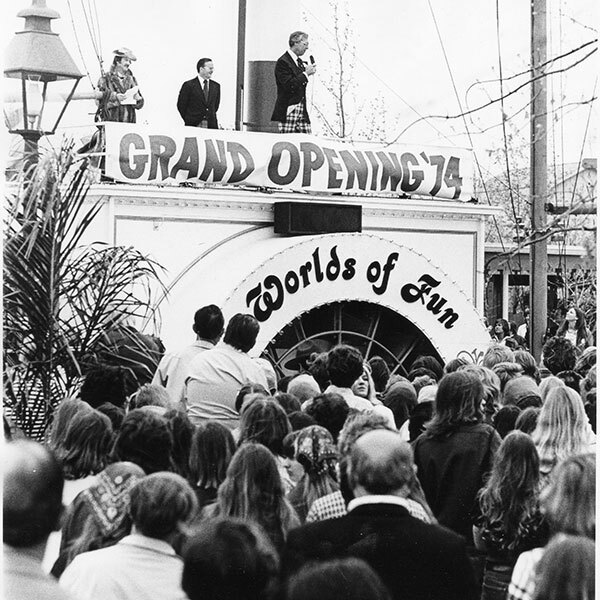 Worlds of Fun opened its gates for the first time on May 26, 1973. 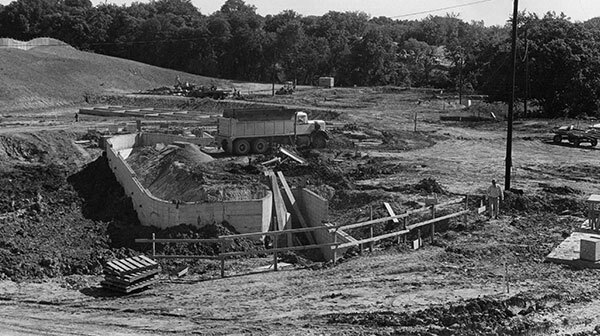 To celebrate the park’s rich history, let’s take a trip down memory lane to the very beginning with 10 facts you may not know about Kansas City’s beloved theme park! 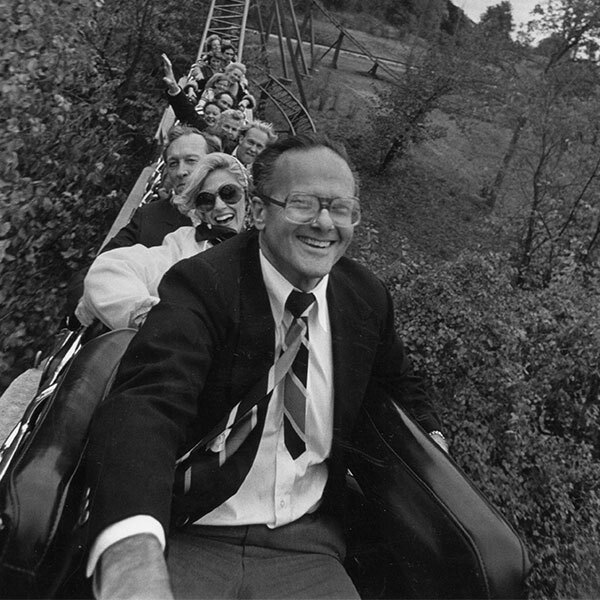 Worlds of Fun was founded by the famed businessman and sports icon, Lamar Hunt. 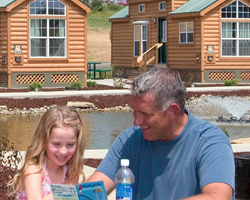 After becoming one of the forefathers of the NFL and founding the Kansas City Chiefs, Hunt and his business partner Jack Stedman had the vision of building a theme park in the bluffs above the Missouri River as a gift to the city. Early accounts say it was a $20-million investment. Worlds of Fun is themed after the Jules Verne novel Around the World in 80 Days. Themed areas of the park include the following continents: Americana, Europa, Africa, Scandinavia and Orient. “We chose the large, multicolored ascension balloon for our symbol because it represents fun, adventure and travel reminiscent of the movie, Around the World in 80 Days. 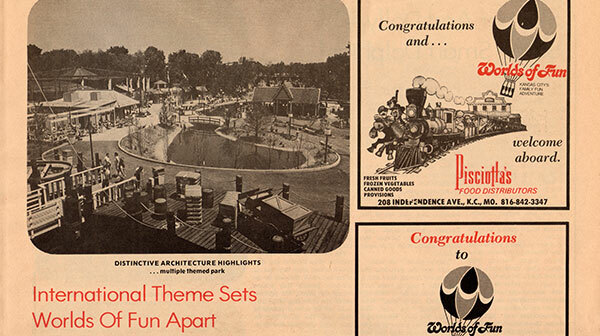 These are the things we want Worlds of Fun to represent.” – Jack Steadman, 1971. 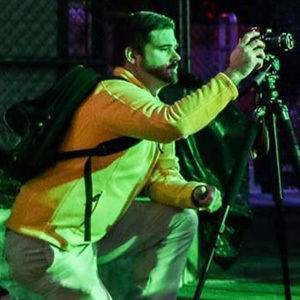 As part of the theming, Stedman went to the historic movie prop sale at MGM Studios in Hollywood to find large pieces of cinematic history to incorporate into the park. Stedman returned with boatloads of goodies. Henrietta – from the movie Around the World in 80 Days, you would cross over the Henrietta as you entered the park, meant to signify that your adventure and trip around the world was starting. 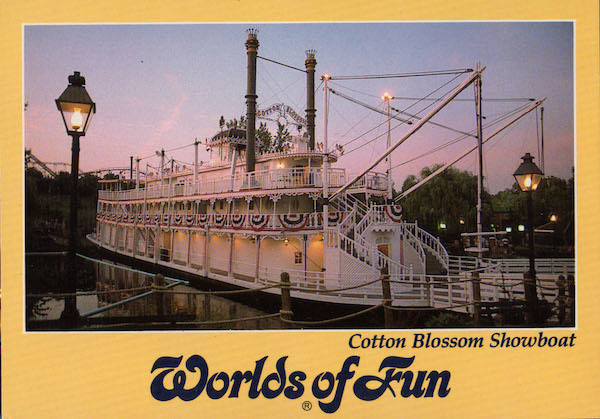 Cotton Blossom –a sternwheel riverboat from the movie Showboat that was showcased in Americana. Victrix – from the movie Mutiny on the Bounty, it was showcased in Scandinavia. In addition to the boats, the War Wagon used in the Worlds of Fun Railway was from the classic John Wayne movie True Grit. 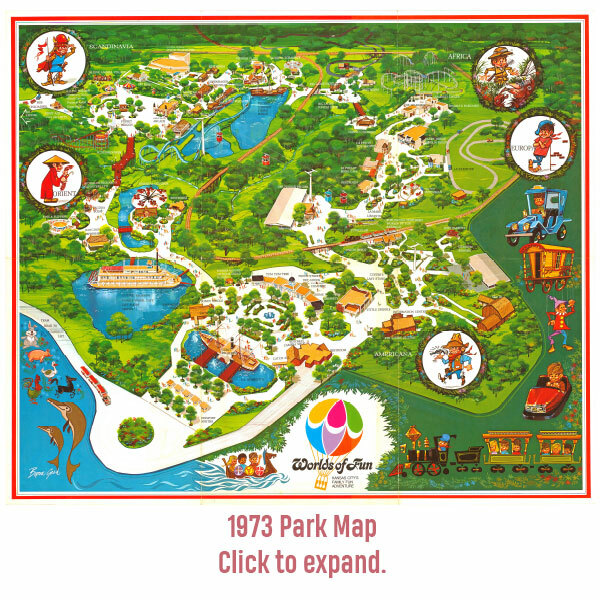 The planning and opening of Worlds of Fun coincide with the rapid growth that occurred in Kansas City during the early 70’s. Expansion of the city included Kemper Arena, Sports Complex and KCI Airport. 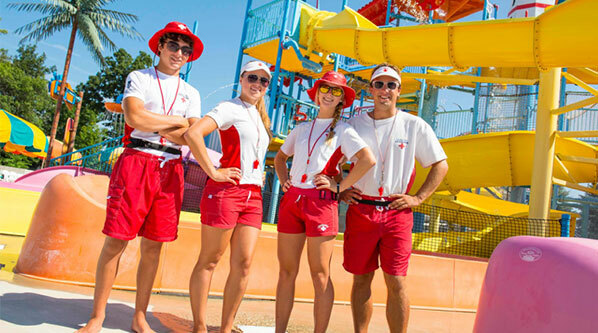 A similar surge was also occurring in the amusement park industry with new parks opening yearly. The city of Kansas City was buzzing with excitement after the park was announced, and everyone wanted to be a part of the massive project. 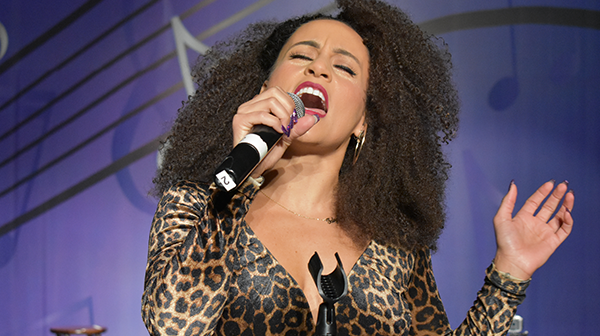 For example, when the live entertainment auditions were scheduled in a major downtown hotel, they expanded from one ballroom to three to house all of the performers and spectators. 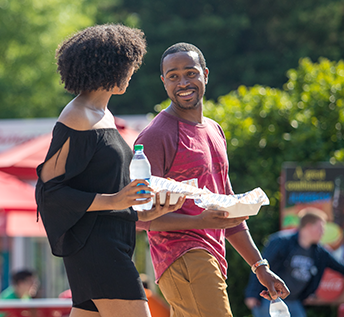 Every guest entering the park on Opening Weekend received a mini loaf of fresh bread. The park also featured a bread cart that would fill the midways with the scent of baked goods. 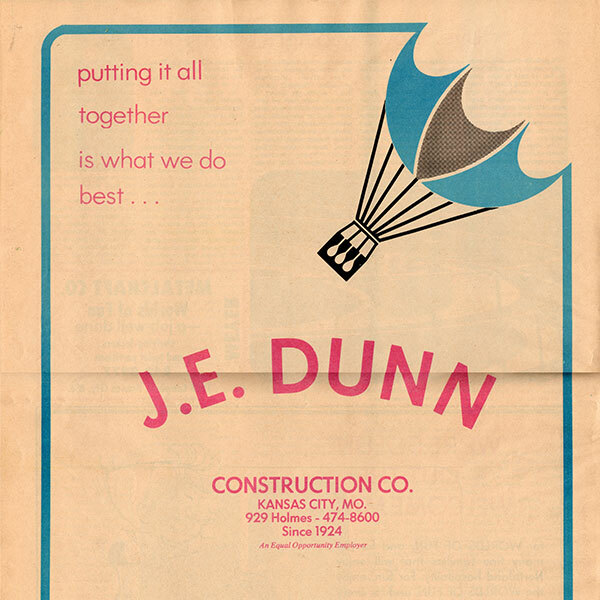 JE Dunn served as the park’s general contractor and Burns & MacDonnel was responsible for the architecture and engineering. Both are Kansas City based and nationally renowned companies. 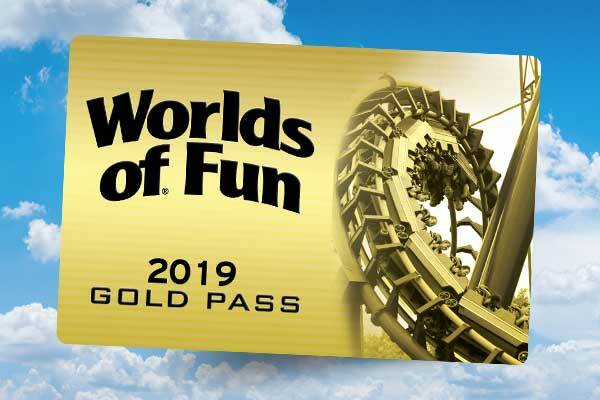 Worlds of Fun was designed by Randall Duell, former MGM Studio art director turned theme park designer. 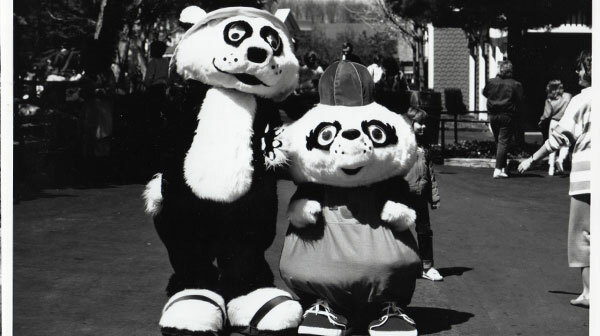 Similar projects Duell worked on include Carowinds, Kings Island, Kings Dominion, Opryland and California’s Great America. 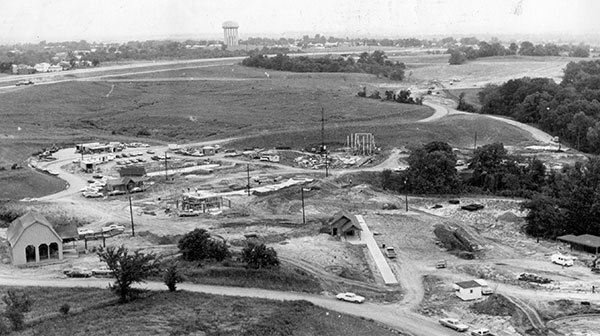 Teams broke ground on the construction in 1971. It took 22 boxcars of lumber, three miles of plumbing, almost three acres of roofing and 35 miles of electric wiring to complete the construction of 60 buildings and 20 rides. 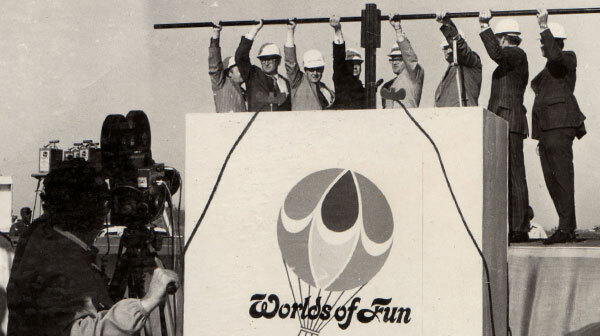 Worlds of Fun was just the first phase one of a larger entertainment complex that was planned by Hunt and Stedman. 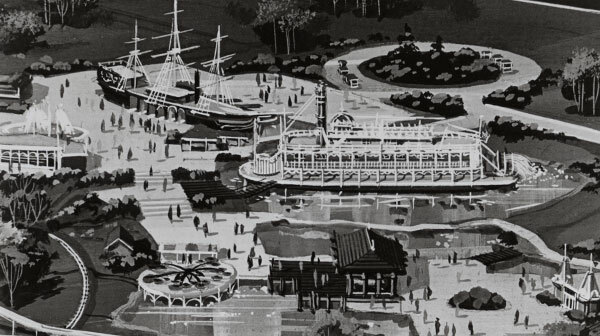 They originally hoped to build a 500-acre complex that would rival Disneyland and include hotels, venues, shops and restaurants. Unfortunately, the 1973 oil crisis hit in October of their inaugural season and put a damper on future developments. 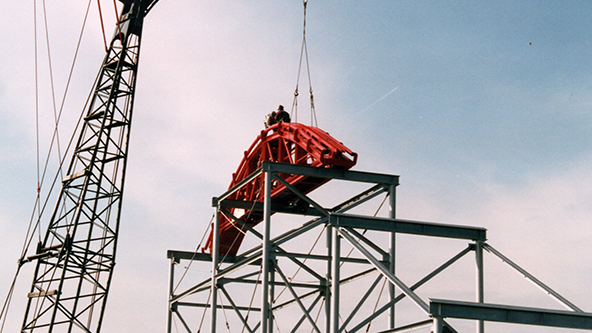 To tie into Around the World in 80 Days, each original ride was named and themed after a form of transportation. Original rides still in operation include The Worlds of Fun Railroad, Le Taxi Tour, Scambler, Autobahn, Flying Dutchman and Viking Voyager. 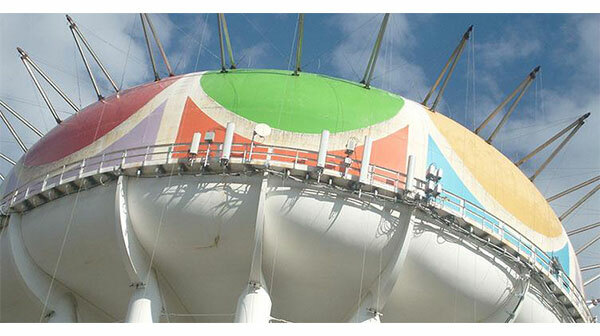 To celebrate the opening of Worlds of Fun, the city of Kansas City painted a nearby water tower with the iconic colors of the Worlds of Fun hot air balloon. It has since become a Kansas City landmark. 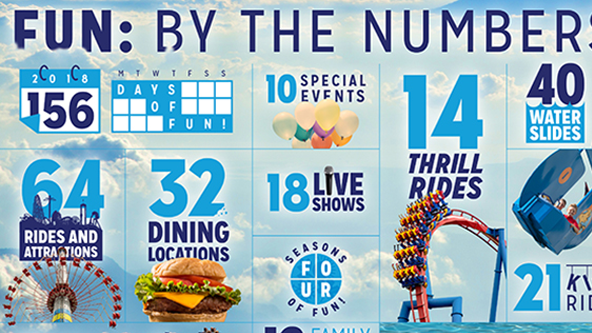 Today, Worlds of Fun stretches over 235 acres and features 64 rides and attractions. 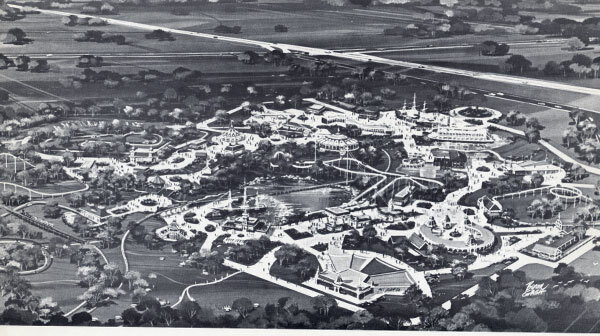 While the park has grown and evolved over its history, it is and always will be Kansas City’s theme park! 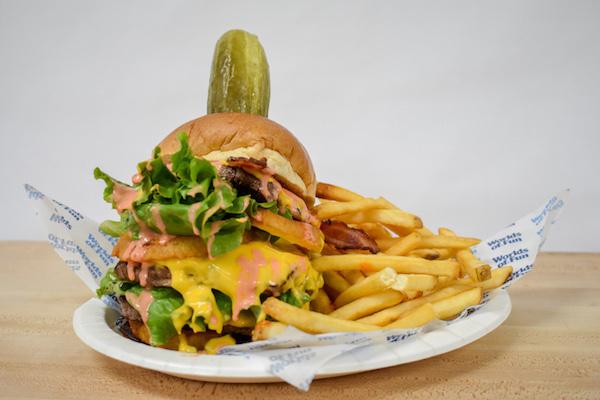 A day at Worlds of Fun can work up quite an appetite. Luckily, our dining plans provide a way for families to satisfy their growling stomachs without breaking the bank. They are packed with value and good eats. 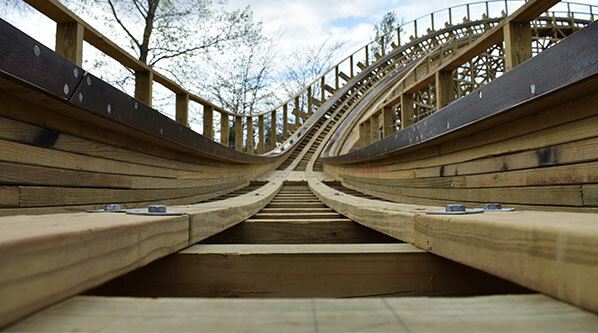 There’s nothing like a ride on a wooden roller coaster, and Worlds of Fun is lucky enough to have two of the best in the world. 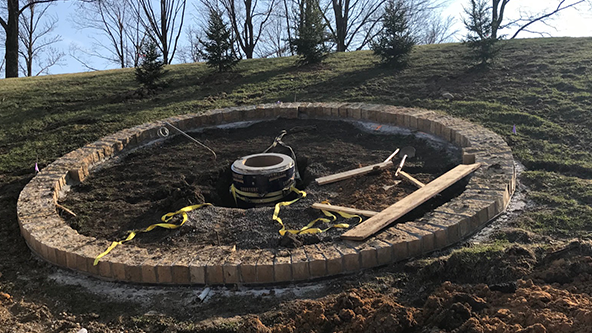 This off-season, we’ve continued our commitment to re-tracking Timber Wolf, and we’ve made some enhancements to Prowler’s first drop. 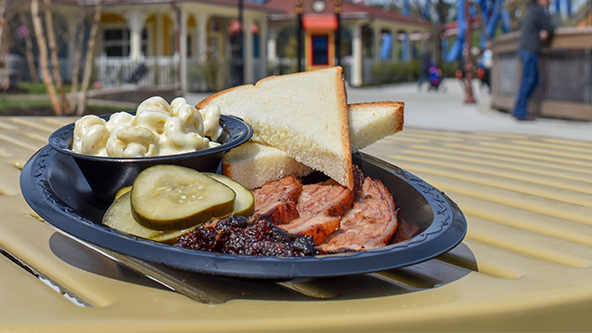 Worlds of Fun's culinary team will be introducing several healthier menu items throughout the park. From health-conscious guests to vegans and vegetarians, we’ve added more delicious options to fit almost any dietary need. Worlds of Fun will be home to this summer’s biggest party with the debut of Grand Carnivale. 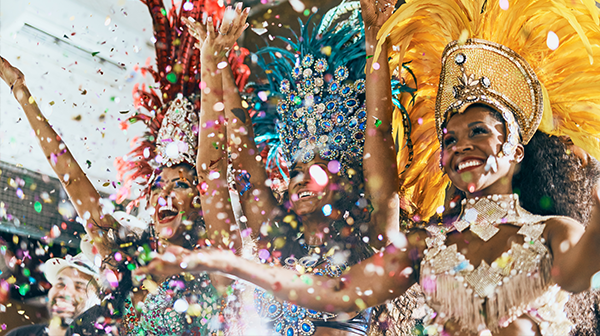 This all-new festival will bring the world’s largest celebrations to life, complete with all the sights, sounds, tastes and traditions to complete your cultural journey. 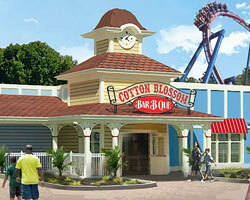 Over five new dining concepts will be introduced this season. 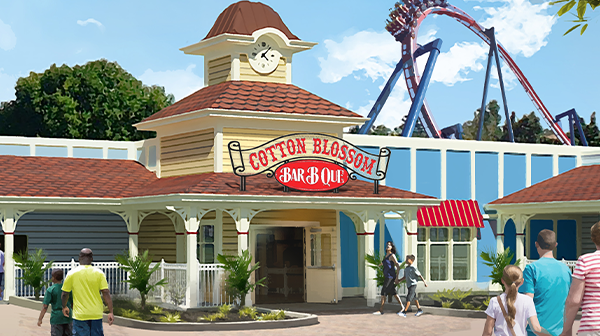 Led by our executive chef Wesley Boston, Worlds of Fun’s culinary team aims to flip the script on traditional amusement park food this season. 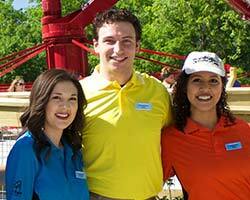 Before Talya Groves made it on Broadway, she was at Worlds of Fun and credits her time with the park's live entertainment team as a major driving force for her success. What goes on at amusement parks when they are closed? You may not think it, but the off-season is a busy time for those lucky enough to work in the industry. 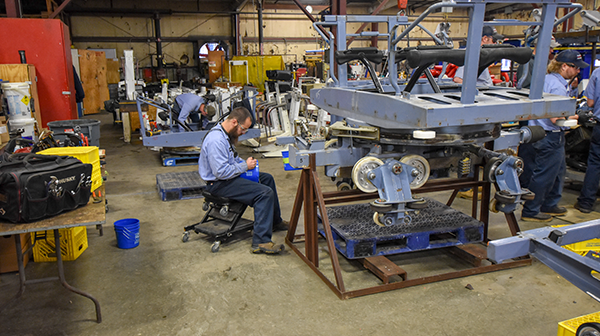 From January to April, much of our time is spent preparing for the upcoming season performing offseason ride maintenance. Tis the season for charitable giving, and Worlds of Fun had the opportunity to work with some great organizations during WinterFest. Take a look, and see how you can help support the impactful work these partners do for our community in Kansas City. As some would say – the best way to spread Christmas cheer is singing loud for all to hear. 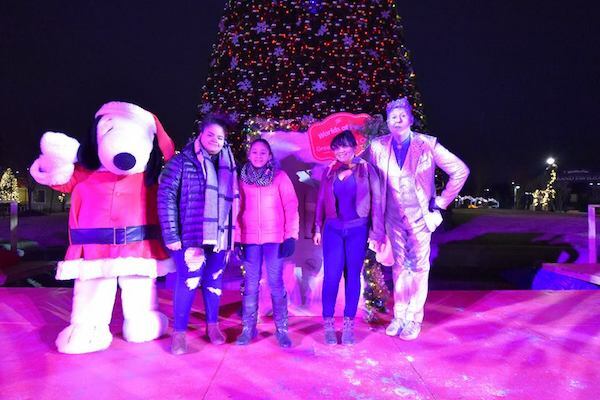 WinterFest does just that, presenting 10 live shows throughout the park with iconic holiday characters and songs that warm the heart and lifts the spirit, they are all a must-see.